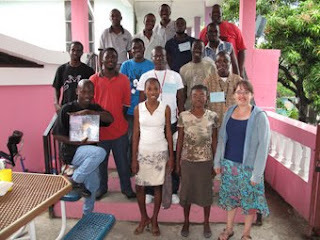 For more about Haitian Creole interpreters, see January 21 post. I’ve heard it said that some of the NGOs and the missionary organizations in Haiti have been able to do more for people in the earthquake aftermath than the UN. One such organization, the Northwest Haiti Christian Mission, has an important medical wing which is now heavily engaged in earthquake relief. The NHCM already had the good sense nearly a year ago to train some medical interpreters to help its foreign doctors. In April, Northwest Haiti Christian Mission interpreters completed a one-day intensive training course in medical interpreting. The course included study of advanced anatomy and medical terminology, as well as training in interpreting best practices, ethics, and skill-sharpening. In all, 16 Haitian interpreters [see photo] participated in the training, which was led by Erika Olsen, NWHCM staff development coordinator and a former medical interpreter in the United States. Good medical interpreting requires precise, objective communication between doctors, interpreters and patients, and can make a major difference in the quality of care patients receive. The course was part of NWHCM’s ongoing efforts to provide greater training and preparation for all its employees. Notice that the trainees were already on staff, and therefore Professional Interpreters for the mission. One day’s training isn’t much in itself, but added to the trainees’ previous experience it classes them as Expert Interpreters. Notice too that the trainer was a medical interpreter from the United States. In America, medical interpreting is becoming widely recognized as a professional activity. There it has its own professional body, the International Medical Interpreters Association, and in Britain it’s recognized as a branch of Public Service Interpreting. The NWHCM’s website is at www.nhcm.org. There’s information there about how to help their earthquake relief efforts. The International Medical Interpreters Association website is at www.imiaweb.org/default.asp. It has started to reach out to other countries besides the USA. You’re probably all bilingual, and many of you speak more than two languages. Are you always aware of which of your languages you’re speaking? In the household where I live, two languages are spoken equally well. Usually we don’t think about which language we’re speaking unless something occurs to draw attention to it. The choice is automatic and unconscious, triggered by cues or stimuli from outside the speaker; the general rule is to respond in the same language as the stimulus. The stimulus is likely to be a remark or a question from somebody else, and the response a sort of ‘follow my leader’. When translating, the situation is different. You have to be aware of which language you’re translating into because it has to be differentiated from the source language. However, there’s an aberrant behaviour that occurs from time to time in simultaneous interpretation (SI). SI is an activity that’s typical of Professional Expert Translators and therefore usually outside the scope of this blog (though see my August 27 post); but the aberration is worth mentioning because it occurs naturally and unconsciously. I call it involuntary shadowing. 1) It’s leftover from the shadowing done in training. But I don’t think so, because shadowing is usually only used in the early stages of training, and most interpreters of my generation didn’t go through a methodical training anyway. 2) Even when training is over, some interpreters continue to practice it either out loud or to themselves. Properly done, it’s a good exercise for improving one’s second-language pronunciation and intonation. Yet I would think the embarrassment it causes would be strong enough to inhibit the interpreter from doing it on the job. 3) The cues that ought to trigger the right language fail to operate. 4) The interpreter has just previously been translating into the language that has now become the source language. This may happen particularly when the speaker switches his or her language in the middle of the discourse. (Bilingual speakers in Canada often do this.) The interpreter merely carries blithely on. 5) Whatever it may be that triggers the behaviour, my last suggestion is that for a brief while, upwards of a minute, the interpreter remains unconscious of which language he or she is speaking. You’ve probably been watching the round-the-clock drama of disaster and rescue on the TV reports of the Haiti catastrophe. Apart from the media, crowdsourcing has now come into its own as a crisis news source and broadcaster. The Ushahidi website, for example, collects messages from mobile phones. I saw a report on CNN about a group based at Tufts University in the USA whose spokesman said they have access to thousands of volunteer translators of Haitian Creole for translating such messages from and to Haiti. This is an instance of where suddenness, urgency, scale and an unusual language combination make NT the only possible solution. Meanwhile the French and Italian Department at the University of Pittsburgh has received more than 100 replies to an email asking for volunteer interpreters to assist with orphans arriving in Pittsburgh from Haiti. The address is losagio@pitt.edu. Language brokering (LB) is generally regarded as an activity conducted in an immigrant family setting or between family members and the community. However, LB (or something very much like it) has been observed in other settings too. In prison, for instance (see References). But closer to the family setting is its occurrence in schools. I myself collaborated with an Ottawa, Canada, schoolteacher to describe something that had been going on in a local school where there was a large immigrant component. Now I’ve come across another paper that describes LB in school, but with a different function. In the Ottawa case, the immigrant children had formed their own corps of interpreters, and they mediated as community interpreters between children and teachers or other school staff on social, administrative or disciplinary matters. In other words, in school but outside the classroom. In this other study, the interpreters mediate in the teaching/learning process inside the classroom. In many classrooms, like the one we focus on here, teachers possess minimal or no command of the language(s) spoken by their recent immigrant students. Thus, they rely on other students to act as language brokers to make the curriculum at least minimally accessible to new arrivals… However, classroom language brokering as seen from the point of view of the intended beneficiary, the child who does not have a sufficient command of the language of instruction to obtain full access to the curriculum without the aid of a translator, remains an unexplored area. Here’s a sample to give you an idea of it. Ms. J [teacher, monolingual English with a few words of Spanish]: This time you’re going to remove four toothpicks to form two squares that are equal in size, they gotta be the same size. Teacher explanations of new academic content involve complex concepts that are unfamiliar both to the translator and to the beneficiary of the translation. Indeed, because the content is both unfamiliar and complex, student language brokers often lack the necessary domain-specific vocabulary in the language into which they are translating. Such domain specific scientific vocabulary provides a basis for developing scientific concepts and relationships and forms part of what students are learning for the first time in Ms. Jackson’s class. None of the students who undertook the task of translating for their peers had ever studied science in Spanish beyond the elementary school level. None of the students had ever been taught translation. Altogether a well-observed study of brokering and translation in yet another everyday context. Carolyn Bullock (Carleton Board of Education) and Brian Harris. Schoolchildren as community interpreters. In S. E. Carr et al. (eds. ), The Critical Link: Interpreters in the Community. Papers from the 1st International Conference on Interpreting in Legal, Health and Social Settings, Geneva Park, Canada, 1-4 June 1995, Amsterdam, Benjamins, 1997, pp. 227-235. Robert Bayley, Holly Hansen-Thomas, and Juliet Langman (U. of Texas at San Antonio). Language brokering in a middle school science class. In J. Cohen, K. T. McAlister, K. Rolstad, and J. MacSwan (eds. ), ISB4: Proceedings of the 4th International Symposium on Bilingualism, Somerville, MA: Cascadilla Press, 2005, pp. 223-232. There’s an English resident here in Valencia who gives private English conversation lessons to local children and adolescents. In theory the children already know some English, because it’s a compulsory subject in the schools. In fact they do know the basic grammar and an assortment of vocabulary, and they get through their exams by answering multiple-choice questions about them. But they can’t speak English conversationally. If you ask them a simple question like, “How are you today?” they’re nonplussed and don’t know how to reply. So some parents, who want their children to be able to function in English, are prepared to pay for conversation lessons - and sometimes older, quite advanced students are too. Motivation and encouragement are also important factors. 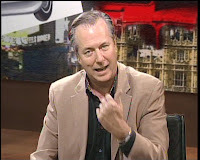 My informant’s role model is Richard Vaughan, an American living in Spain (see photo), whose English conversation programmes are very popular on TV. And rightly so, for his easy-going personality is very encouraging and amusing, truly ‘English without tears’, and he’s had a lot of experience. I’ll say more about him soon. As my informant’s classes are small, only one to three students, she has far more opportunity than teachers in the schools to observe and adapt to individual variations. One of her current students has a special difficulty. He’s a 14-year-old boy, first language Spanish, and he’s done about five years of English at school. The problem is that he can’t or won’t respond to anything he’s told in English without first translating it into Spanish. Any question that he’s asked, he will first translate out it loud before replying to it, although he’s been told time and time again not to do so and he's not otherwise a difficult student. I call it compulsive translation. His behaviour can’t be attributed to the teaching method in school, which in principle doesn’t use translation. It’s true that the teachers, who have to cope with classes of 30 or more, often despair of explaining everything in English and revert to translation; but they do so as little as possible, and there are no translation exercises, and and there's no translation in the examinations. So most of the students are close to being Natural Translators of English. Perhaps the behaviour isn't so strange if we consider what a well-known teacher of translation and of French in Canada, Jean Darbelnet, once said. He told us that it was illusory to think one could teach a second language and ignore translation, because the students were constantly translating to themselves anyway. However, the peculiarity in the present instance is that the student insists on completing the translation process (utterance to utterance) by speaking the translation out loud. If anyone knows a good cure for this behaviour, my informant would be glad to hear about it. Jean Darbelnet. Pour une revalorisation des exercices de traduction dans l'étude des langues. Culture 24.353ff, 1963. 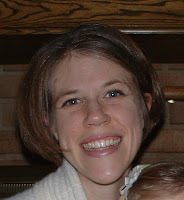 Lisa Dorner (see photo) has kindly sent me one of her recent articles. Although she’s actually at the University of St Louis-Missouri. I tend to think of her as one of the UCLA group that also includes Marjorie Faulstich (see September 19 post). Here’s the abstract. Examines how immigrant adolescent development is shaped by the cultural and linguistic practice of language brokering.Framed by theories on interdependent/independent developmental scripts, the changing experiences and views of 12 Latino/a children of U.S. immigrants over 5 years were analyzed. It was found that translating is a relational, interdependent activity in which adolescents both help and receive help from family members. As adolescents, they extend this helping orientation beyond their household, but in these public spaces, they sometimes meet up with other developmental scripts. This article’s examination of brokering’s effects on immigrant adolescence leads to the discussion that one must consider the manner in which all adolescents and parents are negotiating independent and interdependent worlds. The languages involved are of course Spanish and English. The locale is Chicago. Translating and interpreting are not solitary activities; they are social and relational events in which families engage together and in relation to society. "It kind of bothers me when I’m watching TV and my mom’s sitting right next to me, and I’m trying to pay attention, like what they’re saying [in] a movie and something, when it’s really hard to understand, like what’s building up into the action. And then my mom’s like, 'Qué dijo? What did they say? Qué está pasando? Qué están haciendo?' [What’s happening? What are they doing?] I’ll be like, 'Mom, please let me listen and I’ll tell you.' She’s like 'Ay, yo ya me voy a dormir porque tú no me explicas. Yo aquí estoy bien aburrida y no le entiendo nada.' [Fine, I’m going to go sleep because you won’t explain it to me. I’m here totally bored, and I don’t understand anything.]" This last task, accompanying elders to the doctor’s, places a good deal of responsibility and possibly emotional strain on children. It reminds me of a discussion I had at the Castelló symposium (see November 18 post) with Claudia Angelelli from San Diego State University. She teaches translation to bilingual adolescents who are classed as exceptionally gifted. She told me she constantly comes up against people who are opposed to such teaching, because they believe it encourages the imposition of a harmful burden of responsibility and stress. Well, I certainly think doctors and other health professionals should be told not to use children or indeed any other sort of untrained translators, not least because of the potentially serious consequences of any mistranslation. But for better or worse it clearly goes on a lot, and there are emergencies where it may be a choice between LB and complete incomprehension. We have found that this passing down of the work (and sharing of it) is common in families with two elder children close in age. That brings in another feature of LB: cooperative translation. Lisa M. Dorner, Marjorie Faulstich Orellana and Rosa Jimenez. ‘“It’s one of those things that you do to help the family”: language brokering and the development of immigrant adolescents’. Journal of Adolescent Research 23: 5.515-543, 2008. In his paper to the Castelló symposium (see November 18 post), Ricardo Muñoz Martín (RMM - see photo) began by estimating the extent of bilingualism in the world. His survey is relevant to this blog because the Natural Translation Hypothesis asserts that all bilinguals can translate, subject to certain limitations like the extent of their proficiency in their languages. So the number of bilinguals would be an indication of the number of people, or the proportion of the world population, who can translate something, no matter how limited. He continues with some other factors. There is probably no country in the world with no immigrants at all. Qatar, with a population of 800,000 citizens, has Arabic as its only official language, but more than 150,000 Filipino immigrants live there who speak other languages as well [and] Spain, where there are at least twice as many speakers of Moroccan Arabic as there are of Basque [which does have official status]. In the last decades, for example, English has become the third language spoken in Spain during the summers, and the locals have had to deal with it. We should also consider the impact of educational institutions and mass media, which offer foreign language training to some or all of the citizens in most countries. In Finland, for instance, 60% of adult residents claim to speak English, and more than 15% think of themselves as speakers of German. To all that, I want to add another category which RMM does not mention and which gives me pause. The common notion of a bilingual is someone who can speak two languages. But what about the people who can understand a second language yet can’t speak it? This less evident relationship between languages is called passive bilingualism. It’s the bilingualism of the many people who learn dead languages like Latin or Biblical Hebrew. But it’s not confined to dead languages. In a survey of residents of the city of Valencia, Spain, all of whom can speak Spanish, only one quarter of the respondents declared they could speak Valencian but three quarters said they could understand it. That’s a big difference: half a million people. What does the Natural Translation Hypothesis have to say about passive bilinguals? Logically it might imply that they can translate but only in one direction. However, in the absence of any data, I wonder. The Latin in the title, Nomen mihi Legio est, is a Biblical allusion that translates in full as My name is Legion, for we are many. One of the things I did during the Christmas break was go and watch a pilota match. 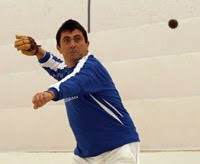 Pilota is a traditional Valencian handball game with a documented history going back to medieval times. The players are called pilotaris. It’s basically similar to the more famous Basque pelota game and requires similar skills - Valencians and Basques occasionally play against one another - but there are also many differences. Some versions are played on an indoor court, some in the street: the championship indoor court in the city of Valencia, where I saw the Chrismas match, dates back to 1868. It’s a fast game when it’s not being interrupted for betting. But as much as for the game, I like it for the atmosphere. Today the top players are professionals, but there’s none of the crushing commercialism of professional football. Players and spectators mix with and greet one another in the bar before the game, and there’s a strong smell of cigars. Only men play and the spectators are 95% men. Similar handball games are played in other countries - France, Belgium, Italy, some parts of Latin America - and in recent years they’ve joined with the Valencians and the Basques in an international federation. Now the Valencians have discovered there are long-established versions in Britain, including Ireland. The best known of them is called fives (from the five fingers of the player‘s hand). But unlike pilota, fives isn’t a popular sport. On the contrary, it’s elitist, being played only in some of the ‘public’ schools (see my post of December 2) and by the alumni of those schools at a few universities. So some English officials have visited Valencia and seen the game here in preparation for taking part in the European championships next September, and they were duly entertained. However, there was a language problem. The Valencian players are bilingual in Valencian and Spanish but they don’t speak English. The English don’t speak Spanish. So into the gap leaped Fran Zanón, a pilotari who happens also to be a university student of English Language and Literature, to explain the Valencian game to the visitors. A Native Translator with the right extralinguistic background. The English were impressed. “He must be a great pilota player,” remarked one of them. 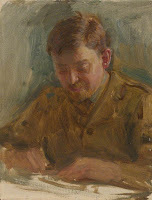 Alberto Soldado. La tradición inglesa llega a Valencia en 2010. Levante-EMV newspaper, Valencia, December 21, 2009. There are articles on Valencian Pilota and on Fives in Wikipedia.